No Time Limit - Your real estate listing is active on FSBOMichigan.com UNTIL SOLD, listed with a full-service realtor or taken off the market (See note at the end). The fee is a flat fee with no commission. Your only obligation is to keep us informed by phone or email of the status of your home sale and to schedule a time for us to retrieve the sign package. See Flat Fee MLS option below (#19). Narrative Space - Complete description of your property, including unlimited narrative description space. Brochure Box - Attractive free-standing custom brochure box—you keep it filled—with web-generated brochures (see #7). 12 Color Images - Images uploaded by property seller at any time or we will upload them for you. Existing images may be replaced with new images at no cost. If you need more than 12 images, just let us know (no charge). Site-wide SPOTLIGHT positioning - just by logging into your account every 60 days. No extra cost for feature advertising. Printable Flyers (3 options) - Attractive ready-made brochure and For Sale signs. 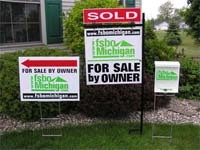 Displays a QR code that links directly to your listing on fsboMichigan.com. Great for bulletin boards. Virtual Tour Link - Link to your own virtual tour or Youtube video. Personal Website Link - Link to your own personal website. HTML Generator - Easily generate HTML for your craigslist ad or other sites where HTML is accepted. Social Media - Facebook Share button on your own page. And, we post your home to popular Social Media sites. Hit Counter - Your listing keeps track of its own hits. Real-time Updates - Unlimited real time changes to your website listing. Instantly change any aspect of your listing through convenient user forms on our website (or we will do the changes for you). Real estate Forms - Purchase Agreement, Seller's Disclosure, Lead Disclosure downloadable off the web site. Seller Resources - Information for sellers and buyers on the 'for sale by owner' process. Help from Professionals - Service directory of well recommended allied professionals (attorneys, mortgage companies, appraisers, title companies, inspectors, etc.). Local MLS Option - List on your local Multiple Listing Service with packages for 6 months or 12 months and up to 25 images. Get the exposure of the MLS and Realtor.com as well as the exposure of FsboMichigan. If you sell through the MLS agree to pay buyer's agent 3%. You can still sell by owner and avoid those costs, or sell through the MLS and pay less than anyone else. Get the best of both worlds! Your listing ends when your property is sold, taken off the market or listed under an exclusive right to sell contract. Note: You must log into your account every 60 days to keep your listing active on the site. This ensures potential buyers that they are viewing current homes for sale.